Mary from the Prairie: money, money, money, money ... MONEY! Back in the 80's there was a movie called "The Money Pit". In this movie, Tom Hanks and Shelley Long play a young couple who buy what they believe is the "perfect" house at the "perfect" price. It's not long before they find their new home is really a fixer-upper, and not much longer before they realize how much fixin' this old house really needs. Every time they'd fix something, another thing would go wrong, or the thing they just fixed would need re-fixing, requiring more and more money to be spent just to make the house habitable. Don't you sometimes feel that way about life? I know I do. Things seem to be going pretty good, and BAM! The washer and dryer quit working. Then you receive a photo package in the mail of you running a red light. Not only do you have to pay the ticket, but your insurance rates go up ridiculously as well. Then the dog gets sick, requiring long-term medication and periodic blood tests at the vet, to the tune of $150 per visit. And to top it off, your job implements cutbacks, which cuts your income down to 90% of what you were barely making it on before all this other stuff happened. Your life just morphed into a money pit! When financial circumstances seem like a bottomless abyss, it can be easy to focus on how little we have, and our desire to have more. There is a statement in the Bible. It's in Paul's first letter to Timothy (1Timothy 6:10). (It's to the right-hand side of the Bible, almost - but not quite - to the end.) It says, "For the love of money is a root of all kinds of evil." What? Money is evil? But we need it to pay the bills, feed the kids, for everything! No, in and of itself, money is neither good nor evil, just as a chainsaw is neither good nor evil. Both are merely tools. It all depends on what you want to use it for (remember the Texas Chainsaw Massacre movies?). We all want money because of what we can do with it. We can use it to fix the house, pay for college for the kids, save it to sustain us through lean times, and invest it for retirement. Or we can choose to spend money on what entertains our momentary whims, to fill our bellies - sometimes to excess, or to help us mask our pain that we don't want to feel. 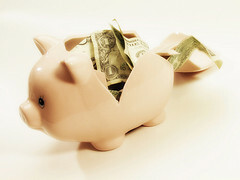 It's when we use our money without sound purpose and planning that we seem to contribute to our own money-pit syndrome. One of the only shows I will go out of my way to watch is The Celebrity Apprentice. In the show, two teams of celebrities are given various business endeavors to perform. It may be anything from which team can raise the most money selling cupcakes, to designing a 3-page magazine ad for deodorant, to a launch-party event for a new product for a major electronics company, such as Kodak. Each team selects a "project manager" who is responsible for making sure the task is completed on time and to the specifications set forth at the beginning of each episode. While somebody from the losing team is "fired" (eliminated from the game), the project manager for the winning team receives anywhere from $10,000 to over $300,000, depending on the amount set for the task, for executing the project better than their opponent. I don't know the exact figure, but I would venture to guess that during the season that just concluded, around $2 million was handed out to the winning celebrities. The celebrities players come from all walks of life: athletes, actors, politicians, comics (yes, there is a very subtle difference between politicians and comics), business entrepreneurs, rock stars, Victoria's Secret models, chefs, and more. Each one starts the game with the hopes of winning as much money as they can. What a greedy bunch of (insert epithet here)! If the money were for him/herself, maybe. But these men and women were not playing for personal gain - they were playing for charity. The outlook toward winning is different when it's for a cause bigger than themselves. The attitude was not "Look at me - See how much money I won!" but rather, "I won $20,000 for my charity. That's x-number of people who will have early screening for cancer!" or "This win means that fewer Americans will go to bed hungry." or "This will bring us closer to a cure for this disease. Someday no kid will have to go through what my daughter goes through every day." They view the money not as something to be amassed for personal gain, but rather as a tool to be used to bring about change, comfort the afflicted, heal the sick, promote social justice. Things that Jesus calls us to do. There is nothing wrong with being financially prosperous. But why do you want the money? Is it to have the big house, the fancy car, the most toys on the block? If so, at what cost? I know a guy who bought a boat so that he could spend more leisure time with the wife and kids. As it turns out, the family is spending even less time together than they did before because this guy has to spend more time working to pay for this boat that sees water only when it rains (and in Southern California, that ain't often)! One sound principle of financial prosperity is to give 10% of what you earn and live on the other 90%. That means if I earn $40,000 a year and gave 10% ($4,000), I'd have $36,000 a year to live on. When budgeted properly, you can still have a comfortable life. But then there are people at the other end of the giving spectrum. People like R. G. LeTourneau. He invented earth mover machines (think "bulldozer" and you get the idea). You might think Mr. LeTourneau might have been financially dyslexic or something. He gave 90% of what he earned and lived on the remaining 10%. I don't know what his annual income was, but let's make the math easy and say it was $1 million a year. That would mean that he kept only $100,000 and gave away $900,000! Because of this one man's priority of generous giving, countless lives were made better each year. Plus, I'd venture to say, if he had a boat, he and the family would have spent lots of time together on the lake! Most of us will never be in the 90% giving bracket. But even if you have not been a consistent giver all your life it is not too late to start. Begin with a goal of a giving a certain percentage of your income every payday, and work your way up to 10% or more. Start with giving to your local church. Don't worry about not having enough left to make ends meet. God sees to it that you will have what you need. It may come in the form of receiving unexpected money. People may unexpectedly invite you to dinner. It may be as subtle as becoming more aware of how you spend what money you do have. Participating in the office's morning Starbuck's run might not be as important any more. Or, this new way of giving might be the extra incentive you need to finally quit smoking. I admit, I do not give as much as I would like to. But because I do give financially on a consistent basis, I am proud to say that I am part of a ministry that feeds the hungry, comforts the afflicted, works against social injustice, provides disaster relief, and brings the love of Jesus to those who might not know Him. If you're a regular giver, I'd like to know how your giving makes a difference in the world. "Aside from its buying power, money is completely useless to me."